Floods are one of the most common natural disasters in the world and the Lower Green River is at risk of severe flooding. Floods are dangerous and destructive, threatening our safety, blocking the movement of people and goods, and causing significant damages. We need to hear from you about the future of your flood protection. by May 1, 2019, 5 pm PDT. The Lower Green River Valley is home to 22,000 residents and supports over 100,000 jobs. It is an economic engine for the entire state, housing the second largest warehouse and distribution center on the west coast and boasting approximately $37 million in gross business income. Major employers such as Boeing, Starbucks, and IKEA are located here, thriving alongside valuable agricultural land, hospitals and medical facilities, schools, parks and community centers, and major transportation routes that move people and goods from work, home and play. There is a lot at stake and a lot to protect. The Lower Green River is susceptible to flooding and flood damage that affects people and property along its banks. A severe flood could have enormous impact on the safety, livelihood, and viability of the community. In the interest of protecting people, property and the environment, the King County Flood Control District is developing a Flood Hazard Management Plan to guide future flood reduction investments. 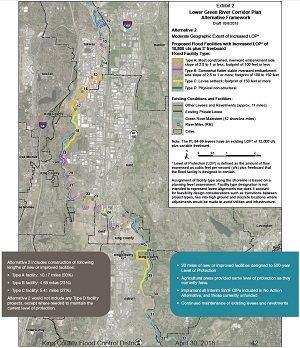 The Plan addresses approximately 21 river miles that flow through the cities of Auburn, Kent, Renton, Tukwila and unincorporated King County. Currently, a Programmatic Environmental Impact Statement (PEIS) is underway to analyze alternatives for flood protection that could be included in the Plan. The PEIS describes potential environmental impacts and measures to reduce or eliminate them. Community input is a critical part of this effort. We need to hear from you – agencies, affected tribes, residents, and members of the public. You may comment on alternatives, probable significant adverse impacts, mitigation measure, and required permits or other approvals. Each of the alternatives includes continued maintenance of existing flood facilities. Alternatives 2 and 3 would also include some drainage improvements to agricultural lands and flood-proofing of agricultural structures. Alternative 1 proposes to take no additional action and implement the 2018-2023 six-year capital improvement program (CIP) as adopted. This alternative is required under SEPA. The “Moderate Geographic Extent of Increased Level of Protection” Alternative. Alternative 2 proposes limited increase in the geographic extent of level of protection. Under this alternative the District would build approximately 20 miles of new or improved facilities. The “Greater Geographic Extent with Increased Level of Protection, Integrated Habitat and Recreation, Agricultural Protection Facilities, and Habitat Restoration Project Partnerships” Alternative. Alternative 3 proposes greater increase in the geographic extent of level of protection, integrated habitat and recreation, agricultural protection facilities, and habitat restoration project partnerships. Under this alternative the District would build approximately 30 miles of new or improved facilities. Agencies, affected tribes and members of the public are invited to comment on the scope of the PEIS. You may comment on alternatives, probable significant adverse impacts, mitigation measures, and required permits or other approvals. The scoping process begins on November 28, 2018, and closes May 1, 2019 at 5:00 pm. A public scoping meeting was held in January to share information with members of the public and solicit feedback. Online. Visit our online town hall to submit comments online. Provide your input on the Draft Programmatic EIS.